The first time the author heard about the segregated regiments organized during the Civil War was when she saw the movie "Glory" in 1989. As a high school and college student she had studied different aspects of the Civil War, but never had black soldiers been mentioned in any of her classes. What she did know, however, was that she had an ancestor who had been a veteran of that war. She knew exactly where he was buried with a GAR stanchion planted next to his Union tombstone in the West Pittston, Pennsylvania Cemetery. In the spring of 1998 she read an article in the Washington Post about a new eleven-foot bronze monument scheduled to be unveiled that July. A creation of Ed Hamilton, it honors the black soldiers and sailors who had served in the Civil War. What she was surprised to discover from the National Parks Database was that her great grandfather would not be among those remembered at the African American Civil War Memorial in Washington, D.C.
Why not? Because he had not served in one of the segregated units whose members’ names are engraved on the memorial wall. Instead, Crowder Pacien/Patience, an eighteen-year old who had absconded from a plantation near Edenton, North Carolina, had served in a white regiment. An identifiably "Col’d" man, he had joined the 103rd Pennsylvania Volunteer Infantry on 01 January 1864 when it was garrisoned in Plymouth, North Carolina. 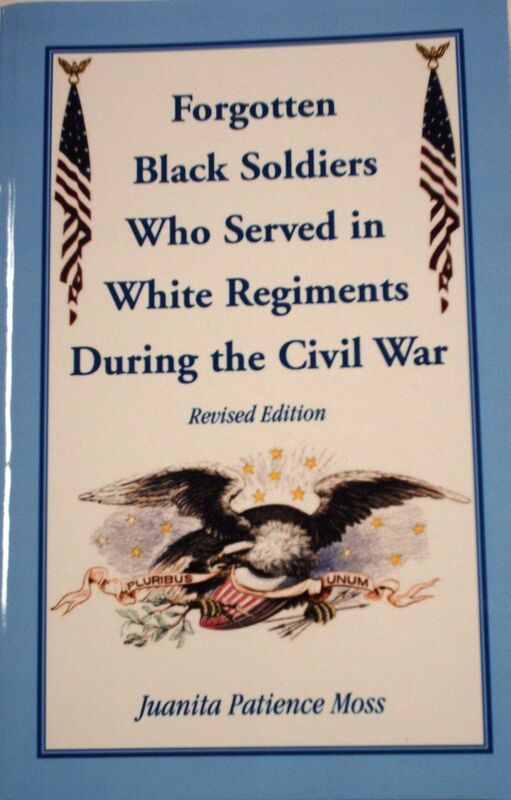 After having been told by several historians that there had been no black soldiers serving in white regiments, the author made a hypothesis that if there had been one such black soldier in a white regiment, as she knew, then there might have been others. This book traces her ten-year journey to find such proof. She concludes that the hundreds of forgotten names she has found should be enough for the "nay-sayers" to conclude that black men indeed did serve in white regiments, even the Medal of Honor winner, Bruce Anderson of the 142nd New York Infantry. The author believes that historians and Civil War "buffs" alike will find new information revealed in this book, even though 143 years have passed since the last shot of the war was fired. Civil War history is still amazingly of great interest to many people and new facts continue to be uncovered. Perhaps an interested reader will want to continue to add to the still incomplete list of nearly 2,000 black soldiers who served in white regiments during the Civil War. An index to full names, places, and subjects adds to the value of this book.